1. Roll out dough on a lightly floured surface with a lightly floured rolling pin into a 13″ round, then fit into a 9″ pie plate. 2. Trim edge, leaving a 1/2″ overhang, then crimp decoratively. Lightly prick shell all over with a fork, then chill for 30 minutes. 3. Line shell with foil and fill with pie weights or raw rice. Bake until side is set and edge is pale golden, about 20 minutes. 4. Carefully remove weights and foil and bake shell until bottom and sides are golden, about 20 minutes more. 5. Remove from oven and reduce temperature to 350°F. 1. Whisk together yolks in a small bowl. 2. Whisk together sugar, cornstarch and salt in a heavy medium saucepan. Gradually add water and milk, whisking until smooth. 3. Bring to a boil over medium heat, whisking frequently as mixture begins to thicken. Remove from head and gradually whisk about 1 cup milk mixture into yolks, then whisk yolk mixture into remaining milk mixture. 3. Add lemon zest, water and Passion Fruit and simmer, whisking constantly, 3 minutes. 4. Remove from heat and whisk in butter until incorporated. Cover surface with wax paper to keep hot. 1. Beat whites with cream of tartar and salt using an electric mixer at medium speed until they hold soft peaks. 2. Increase speed to high and add superfine sugar, 1 tbsp. at a time, beating until meringue just holds stiff, glossy peaks. Pour hot filling into warm pie shell and gently shake to smooth top. 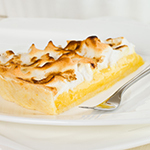 Spread meringue decoratively over hot filling, covering completely. Immediately bake until merinque is golden brown, about 15 minutes. Cool completely on a rack, 2-3 hours. Cut with a serrated knife dipped in cold water.